Discovery RE® is the culmination of over 30 years’ experience in RE teaching and advisory work. We believe RE is about subject knowledge, critical/evaluative thinking and personal spiritual development. Discovery RE gives teachers a solid structure for delivering a wide range of subject content covering 6 of the world’s principal religions. It guides teachers through the enquiry process, starting in the children’s experience, venturing into the world of religion and back into the child’s map of the world. The world our children live in is full of beauty but also full of confusion. Discovery RE can equip and empower children to make sense of it. 1. Does Discovery RE fit our locally agreed syllabus? We are confident that Discovery RE can help teachers to translate their locally agreed syllabus into an engaging scheme of learning for their children. Teachers will however need to assess the extent to which Discovery RE meets the requirements of their syllabus. If you are an Academy, you may choose your own RE curriculum so this will need to be discussed with senior leaders and Governors. The enquiry model, and flexibility as to which religions are taught when, mean we are confident that Discovery RE can make a very significant contribution to the delivery of most agreed syllabi, but it is for schools to make this decision. 2. Which religions does Discovery RE cover? Christianity is taught in every year group as recommended, plus one other religion each year. There is flexibility as to which religion schools choose to teach alongside Christianity in each year group. There are enquiries on; Christianity, Buddhism, Hinduism, Islam, Judaism and Sikhism, plus extra optional Christianity enquiries for Key Stage 2 to allow Church Schools to fulfil their additionality needs. We have also included references to Humanism as an alternative worldview where appropriate. 3. Will Discovery RE helps us with SMSC and British Values? We believe that Religious Education can be a major contributor to children’s spiritual, moral, social and cultural development, as well as supporting their understanding of British Values. SMSC and British Values are both mapped across Discovery RE. The assessment opportunities for both religious subject knowledge, empathy with believers of that religion and reflection on what the learning has meant for the spiritual life of the learner further enhance the opportunities for both SMSC and British Values. See the full British Values page where you can view and download supporting documents. You can download the SMSC map here. 4. Does Discovery RE cover the EYFS? The Early Years Foundation Stage planning in Discovery RE is short-term session planning with suggested activities and resources. It is aligned with the Early Learning Goals and Development Matters and where links can be naturally made, it demonstrates where the activities provide evidence for a variety of areas within these. 5. Does Discovery RE cover attainment targets 1 and 2? Although the majority of locally agreed syllabi have now moved away from AT1 (Learning about religion) and AT2 (Learning from religion), the concepts behind them are still important to learning in RE. Some locally agreed syllabi are also still using the 8-level scale of assessment. Because of these issues, Discovery RE still covers all this content, and shows where the previous “levels” sit within the new assessment procedure, but these have now been adapted to include a 3-strand approach with age-related expectations for each enquiry (working towards, at and beyond). The Discovery RE enquiry model (each enquiry needing the equivalent of six lessons) integrates all the recommended aspects of learning in RE. Each enquiry starts in the child’s own experience, moves into the world of the religion being studied, assesses children’s capacity to answer the enquiry question, and then offers children the opportunity to express their own thoughts and opinions. This resulting process is encapsulated in a simple colour coded process in both the planning format and assessment activities. Red: evaluation/critical thinking in relation to the enquiry question (formerly AT2 impersonal: strand (b) above). 6. Can HLTAs deliver Religious Education through Discovery RE? HLTAs who have had RE training and/or are supported in planning to this level may be able to teach Religious Education successfully through Discovery RE. Many will do a fantastic job. However, RE is a complex subject and demands a certain level of subject knowledge and excellent questioning skills. We would therefore recommend RE is taught by teachers. Please bear in mind that we can offer support and training for all staff teaching RE in your school. Assessment can be difficult in RE, partly because we are assessing very different aspects of attainment and partly because, in the “beyond levels” landscape, schools are using a variety of language to convey outcomes for children. Discovery RE offers a straightforward assessment process. 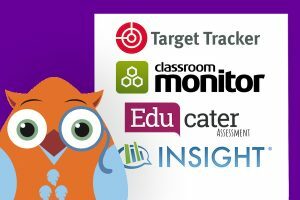 Each enquiry has assessment opportunities which cover all aspects of learning in RE. There are ready made assessment tasks sheets for children to work on and, marking criteria in-line with a “working TOWARDS, working AT and working BEYOND” approach, but where schools can easily adapt the language of the title of each outcome to fit with their own chosen practice. To assist teachers even further, we have written detailed exemplification of each expectation descriptor. This whole process should make assessing RE much more straightforward and help children and teachers better understand progress and be able to compare it with other subjects. As well as expectations for each enquiry, Discovery RE 3rd edition includes end of key stage age-related expectations for KS1, lower KS2 and upper KS2. This is similar to the RE Council non-statutory framework for RE (2013) which also suggests end of Key Stage Expectations. c) Investigating how religions and other world views influence morality, identity and diversity. In Discovery RE, teachers are assisted by a simple colour coded process in the 4 step planning process, assessment activities, expectations and exemplification. This will make is easier to link teaching with learning outcomes. Assessment for learning opportunities are also offered throughout each step of each enquiry. 8. Does Discovery RE contain teaching resources? As Discovery RE is a set of detailed medium term planning it does not include all the resources necessary for teaching each lesson. A great many are included e.g. stories and assessment activities. As far as possible, where external resources are needed, we have signposted teachers to appropriate and useful resources (e.g. by identifying books, texts, websites to use). The resources lists are checked and updated every half-term so schools can check availability etc., on the Community area of the Discovery RE website. 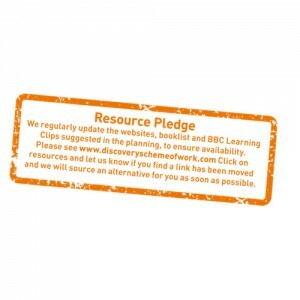 We find alternative resources if, for example, a book goes out of print or a BBC Learning clip is unavailable, so the list is always as up-to-date as possible. The 3rd edition also comes with “The Owl Crew”. These can be used to pose questions for the children (e.g. the “big” enquiry questions). They can also be asked questions by the children using an envelope template provided, which gives the teacher time to consider the answer to the question and build it into the learning in the next lesson. The owls also support both teachers and children in being a talking object/distancing tool when children are discussing their personal reflections on their learning or the issues being studied. 9. 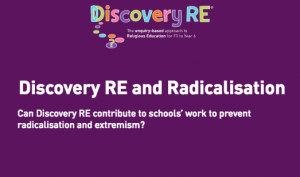 How does Discovery RE help evidence children’s learning in Religious Education? 1. The integral assessment process with ready-made assessment tasks and exemplified marking criteria mean that teachers can formally assess children’s learning every half-term (children participate in this process with a ready-made recording sheet on which they can explore what they need to do to improve next time). The recording and tracking processes also help to inform planning, as well as making reporting to parents more substantial. As well as expectations for each enquiry, Discovery RE 3rd edition includes ‘end of key stage‘ age-related expectations for KS1, lower KS2 and upper KS2. 2. 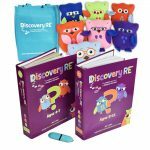 Discovery RE encourages teachers to provide a Discovery RE journal for each child. Journal covers have been designed and can be printed from the supplied USB Stick as an affordable way to make RE books more distinctive and special. These journals collate evidence of children’s work, their reflections on their learning, as well as their assessment tasks sheets and learning progress sheets. Some schools are choosing to collate evidence in class Discovery RE journals. We would encourage this in addition to individual journals. 10. How much curriculum time do we need to deliver Discovery RE? Each enquiry is the equivalent of six lessons. In Key Stage 1, we envisage each lesson to be approximately 45 minutes, although there is enough material and opportunities for discussion to inspire learning for a full hour if the timetable allows. In Key Stage 2 each lesson really needs one hour. We strongly recommend that schools consider blocking their Religious Education teaching time as evidence suggests that children’s learning can go deeper more quickly when time is blocked. This approach also makes life easier in a creative curriculum context. This will allow meaningful links to be made to your curriculum topic where appropriate. 11. How much would Discovery RE for my whole school cost? The hard copy folder, the “Owl Crew” and an e-copy for Years R-6 is available for £750 +VAT. Nursery and pre-school providers can purchase their planning folder, owl and e-copy at a cost of £145 + VAT. 12. Would I get a discount if I buy Discovery RE and Jigsaw PSHE together? We do offer a loyalty discount for schools buying into both Discovery RE and Jigsaw. Information about the Jigsaw PSHE Scheme of Work can be found here. 13. Can I buy Discovery RE for specific year groups? 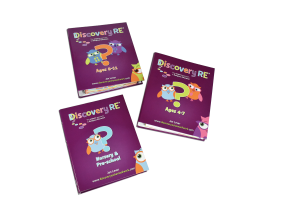 Discovery RE is designed as a whole school approach to RE, so we recommend you buy it for every year group in your school. You can, of course, buy just the material appropriate to the year groups you have in your school. The whole set costs £750 +VAT. Reception and Key Stage 1 is available at a cost of £360 plus VAT. KS2 costs £480 plus VAT. These include a hard copy planning folder, plus the Owls for those year groups, plus an e-copy of the appropriate planning. To order specific year group(s), please contact us or use the online store. 14. Do I have to pay VAT on Discovery RE? Yes, if you are within the UK, – VAT at current UK rate (20%). Outside the UK, EC VAT rules may apply. However, schools can usually claim back the VAT they pay. 15. How do I order Discovery RE? or email sales steve@janlevergroup.com directly with your order. 16. How long does it take for Discovery RE to be delivered? Your Discovery RE order will be with you within a week, usually within a couple of working days. 17. Can I order an inspection copy of Discovery RE? Yes, see the Try before you Buy section at the end of this page. We send you a free USB inspection stick on request. This contains sample Discovery RE planning, the overview of all the enquiries for the whole school programme, and video clips of Jan Lever (Creator and Director of Discovery RE) sharing the approach, assessment process etc…a quick way to get under the skin of Discovery RE. Just contact us or order your USB through the link above. 18. Is there a discount for small schools? We will do our best to accommodate small schools, please contact us to discuss the options. 19. Can we buy Discovery RE as a cluster/family of schools? Whilst each school would need its own copy of Discovery RE, we like to work with clusters of schools so that we can offer bespoke support. We are also happy to negotiate discounts for schools that buy into Discovery RE in clusters. 20. Can you come and train my whole school staff on how to use Discovery RE? We have an excellent team of RE specialists who can deliver introductory sessions and bespoke training. Please contact us to discuss your specific requirements. 21. I'm new to being the RE Subject Leader. What support can you offer me? We have written a Subject Leader Set (available through our online shop) It is essential reading if you would like to know more about leading the subject successfully. Everything from budgeting, resources and training to monitoring and action planning is included at a cost of £100 plus £15 p+p plus VAT. 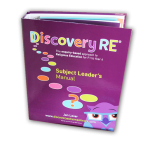 It includes the “Discovery RE Subject Leader’s Manual” which is an easy to use ring-bound folder which is designed to become your Subject Leader’s evidence folder. Informative chapters give practical guidance on auditing, action planning, resources, training, monitoring etc., and suggest the evidence you might like to collate in the manual. It also includes the “RE: How do I do it?” book which guides teachers through an 8-step ‘how to teach RE’ process (free). In addition, you receive a USB memory stick containing the entire RE Subject Leader’s Manual in electronic format along with editable versions of action plans, sample policy plus live links to additional resources. As well as this resource, mentors are available to come into your school and work with you. This has proved successful for schools in the past. Please contact us for details of pricing for this. 22. How does Discovery RE fit into our creative curriculum? 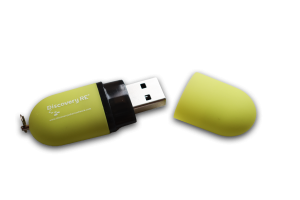 Discovery RE is designed as a stand-alone resource. However, some of the enquiries will easily be integrated into creative curriculum topics. As schools design very individualised creative curriculum topics, it is not possible for us to give a definitive answer about how Discovery RE fits. Sometimes it will fit beautifully, sometimes linking an enquiry to a topic would be too tentative to be worthwhile for children’s learning, meaning the RE should be taught discretely to give it full value. We are happy to advise individual schools on this matter. 23. Will I receive Discovery RE updates? Whenever we revise or add to Discovery RE, we will send schools already using the resource, a link to download the new materials without charge. We will also add articles to the website so you may like to visit the site regularly, especially the Community Area password-protected for schools using the Discovery RE materials. We do our best to look after schools in the Discovery RE Community and are always willing to offer support. 24. Can Discovery RE support my school in fulfilling expectations of the Prevent Strategy? Britain is now a multi-cultural and multi-faith society. Understanding this and the similarities and differences between faiths and belief-systems is vital if extreme views are not to be accepted by our children and young people without critical thought. Effective religious education is vital, and particularly one employing an enquiry approach as recommended by OFSTED, as this will equip children to gain both knowledge and the skills of evaluative thinking. The critical thinking intrinsically necessary throughout Discovery RE encourages children to take nothing at face value and to delve deeper into the beliefs of the religion or belief system being studied. This should help them start to identify when a religious view or interpretation of one, seems extreme. Children are taught to question, to apply knowledge, to consider consequences of beliefs as they are put into practice, and to reflect on their own beliefs. Go to https://discoveryschemeofwork.com/discovery-re-article-on-radicalisation-and-extremism/ for our full article on this issue. Do you offer inspection copies of Discovery RE? We now offer inspection samples with an unlimited viewing time, in electronic format on a handy ‘inspection stick’, a flash memory stick which is USB 2 and 3 compatible. 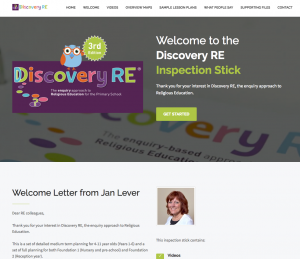 To order your Discovery RE inspection stick, click here. Note there are full instructions and additional help in the following FAQ. How do I use the Inspection Stick? Insert the USB stick into your computer’s USB port. You may need to wait a moment for your anti-virus scan to complete before you can access the device. Note some schools may employ a USB port blocking technology to protect the network from malware. It this is the case, you will need to ask your system administrator for help. When you first open the stick in Windows Explorer or Apple Finder, a window will open and display a number of visible files and folders. Double-click the Welcome(.html) file to begin your Tour. Your default web browser will automatically launch and the Welcome page (shown here) will appear. Please be patient as due to a large amount of content, the page may take some time to load completely. Our inspection material is presented like a local website. An internet connection is not needed to view these materials. 3 complete Enquiries; 1 selected from year groups F2, Y2 and Y5. During playback of videos, you can expand them to full screen using the on-screen controls that are overlaid in the video window, without losing your place in the web browser. Navigate your way through the files and folders on the stick (e.g. folder ‘stick3.0’ if listed first) then into the ‘video’ folder. You will see all the videos and should be able to play them all from there. If you still have trouble, please first ask your own I.T. department for assistance to ensure you have the required software installed on your computer to play H.264 encoded videos with AAC encoded sound. We have tested these videos with Microsoft Windows Media Player, Apple Quicktime and VLC player and all function perfectly. If you have any questions regarding the sample materials, please call our team on the number(s) provided at the bottom of this page.